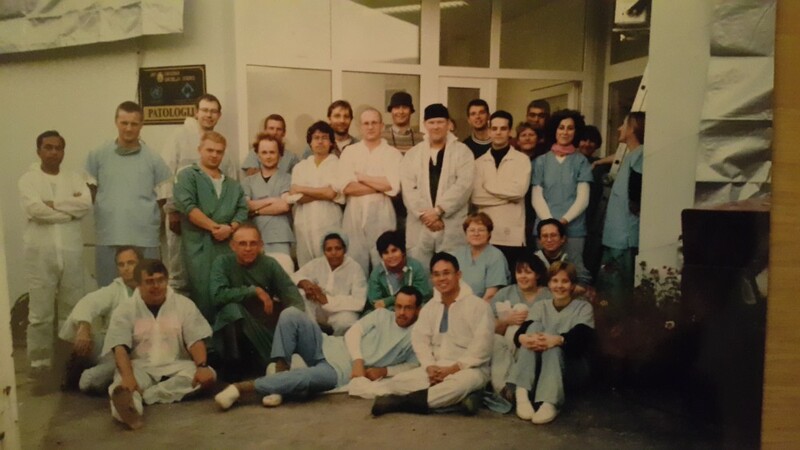 My first deployment to Bosnia was in 1998 and I joined a team of other forensic experts; archaeologists, anthropologists, pathologists, radiographers, police Officers/scene of crime officers and not forgetting the secretaries and other support staff. To conduct post-mortem examinations to establish circumstances and cause of death in each case. To record all evidence and preserve for any subsequent proceedings. 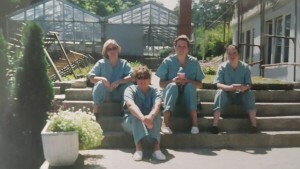 My base was a mortuary in the town of Visoko just outside Sarajevo and I still remember vividly my first day ‘on duty’. Death was my normal day job but on that day I felt completely overwhelmed by the enormity of the task ahead of me and the responsibility placed upon us. I had come to work in Visoko leaving behind my husband Greig and two very young children: Lucy age 3 and Emily age 1. Their support along with all the rest of the family meant I did not need to worry about how things were at home which allowed me to focus 100% on the work. The teams were looked after in Visoko by local families who shared their homes with us in order that we had somewhere comfortable and friendly to unwind after the gruelling days. To be hosted by these families was a comfort when we were all missing home. 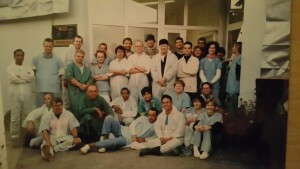 The work was extremely emotional and physically demanding but I felt it was so important that in the years 1999 and 2000 I returned to spend a further 2 to 3 weeks working in the mortuary. Some would say that it was a rather odd way to spend my annual leave but the work meant so much to me I was compelled to see it through to the end. 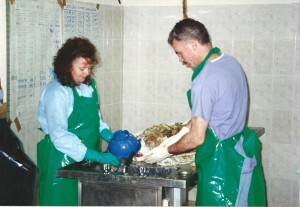 My work in Bosnia, gave me a very keen interest in the mortuary management of mass fatalities and gave me the experience to then go on and deploy to other incidents worldwide: forensic investigations in Kosovo 2002; Victim Identification in Thailand after the Asian Tsunami 2004; inputted into the London Mass Fatality Plan that was activated after the London Bombings in 2005; Mortuary Management Capacity Building in Iraq 2011. I also had gained the experience to plan, set up and manage a temporary mortuary in Northern France where we excavated, from a mass grave, 250 WW1 soldiers (British and Australian) and to date have identified, by name, 150 of the servicemen who were killed in the Battle of Fromelles July 1916. As forensic professionals we always tend to distance ourselves from the more human side of any incident or atrocity, so in Bosnia, apart from what was reported in the UK Media at the time, I didn’t delve too deep into the background and the politics. We have a responsibility to remain objective and use strict forensic protocols whilst gathering evidence in order that it is credible to present to the international court. We tended to focus all our attention on the work and not so much on the personal stories. For this reason, it was incredibly important to us to get an opportunity to return to Bosnia almost 20 years from when we were first there. 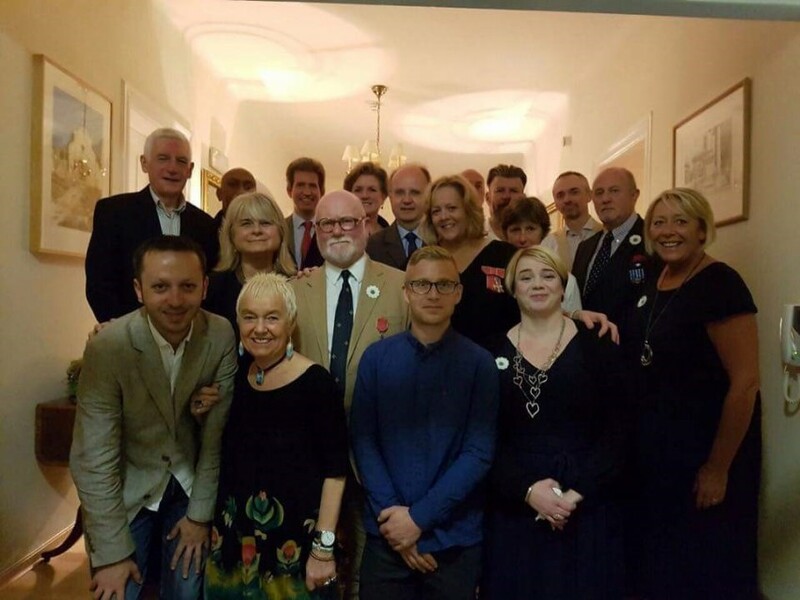 A team of delegates was put together by Robert McNeil MBE, Vice Chair of Remembering Srebrenica Scotland, himself a former ICTY team member. 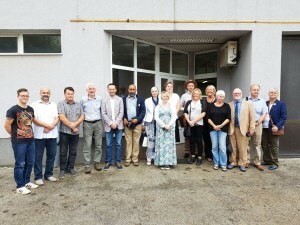 The trip allowed us to reconnect with our colleagues from Scotland, England, Wales, USA and Bosnia. 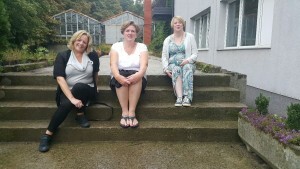 Strong bonds were formed between members of the forensic teams as no one else could really understand the horrors of what we saw so to share the trip with these colleagues was fantastic. For those of us with partners who could manage the trip it was a valuable experience for them, for once, to feel included. 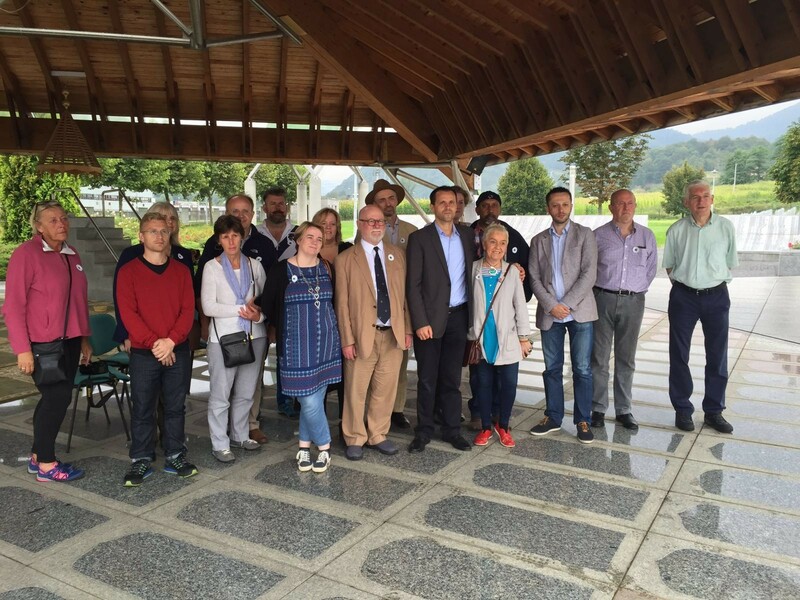 The trip facilitated by Remembering Srebrenica’s Lessons from Srebrenica Programme was an experience that I will never forget. It allowed us to learn more about the effect the Genocide had on the people of Bosnia and what our work actually meant to them. It was a very emotional trip and I think for the first time we allowed ourselves to let our defences down and show our vulnerability. Our wonderful host for the trip, Resad Trbonja, told us very personal and, at times, I’m sure painful stories. We were able to return to Visoko and visit the Srebrenica Memorial that is now there and the Mayor of Visoko made us feel very welcome with a wonderful reception. 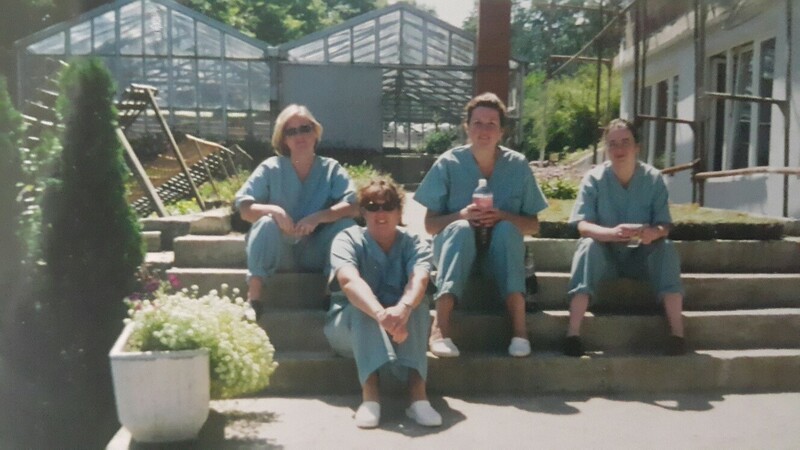 The trip back to ‘our mortuary’ allowed for lots of reminiscing, recreation of a photo taken back in 1999 (albeit minus one who unfortunately could not make the trip) and the obligatory ‘team photo’ outside the main door. 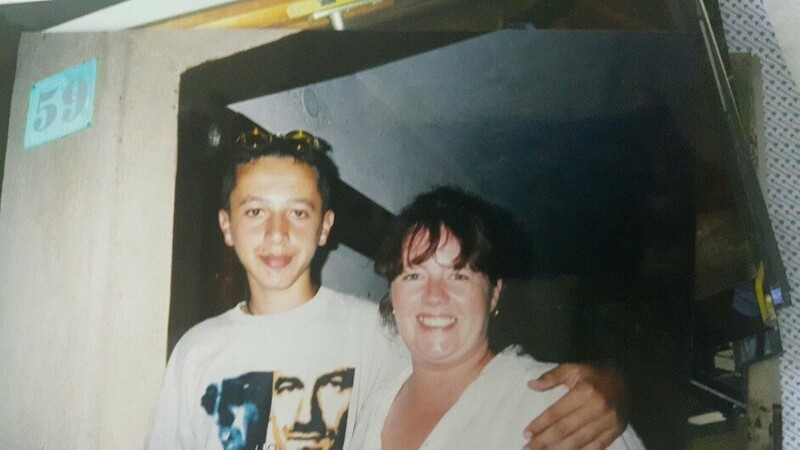 The little lad, Muhidin Tabakovic, who used to hang about the mortuary entrance and run errands for us for some pocket money is now a grown man. This made me feel rather old but I’ll get over that! We were also given time to visit some of the families who had looked after us so well all these years ago. This was completely unannounced and the look of delight when they realised who these strangers at their door actually were was something that will stay with me forever. No one could fail to be moved by the haunting visit to the Dutch UN Base and the Potocari Cemetery. Here we met Nedzad Avdic who gave us a chilling account of his horrific experience escaping execution. What a courageous man. 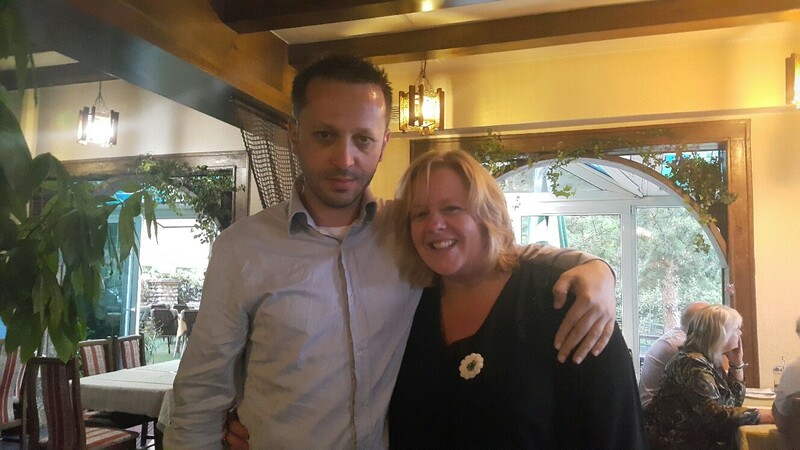 We also met with a Mother of Srebrenica, Fadila Efendic, an amazing inspirational lady who made us laugh and cry! Her story of rebuilding her life after the atrocities that befell her family inspired us all and was a fitting end to what was a day of heightened emotions. The trip allowed us to see firsthand that our investigations went a long way towards the conviction of the war criminals responsible and also helping the victims and their relatives get back some degree of dignity and a point of grieving for their loss. I believe strongly in the UN Declaration on Human Rights that states that: “everyone has a right to an identity, even after death”. It is comforting to know that the work continues and that every effort is being made to identify those that still remain in the ICMP Facility in Tuzla and those that have still to be recovered. 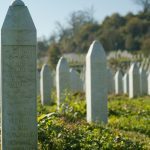 There are those still in denial that the Srebrenica Genocide happened. To move forward this must be accepted and as forensic professionals, who provided the evidence, we are capable of challenging those beliefs. I will continue to stand up to hatred and intolerance and spread the messages of Remembering Srebrenica to as wide an audience as I possibly can. Alison Anderson MBE, Mortuary Services Manager, NHS Lothian, Edinburgh.